A complete program that allows recipe collectors, and chefs to organize, catalog, and manage their recipe collections on their PCs! 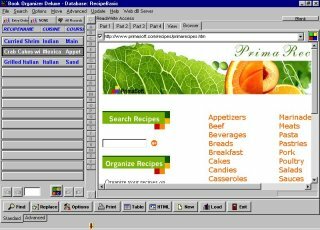 Recipe Organizer is a complete program that allows recipe collectors, and chefs to organize, catalog, and manage their recipe collections on their PCs. Organizer is intuitive and easy to use for the beginner, at the same moment feature-rich and powerful enough to satisfy the most advanced users. View, Retrieve Information: The program organizes and displays the data efficiently, so that the information is readily accessible in a variety of ways. You can arrange information any way you want to view it. Flexible search, powerful filter, and multilevel sort functions allow you to find and retrieve information easily. Report, Label Wizards: You can quickly define and print a variety of reports, labels directly from the program. A detailed set of wizard dialogs let you define the report characteristic (color, size, margins, graphics,.. ), report layout , report sections (header, footer, ...). You can save settings to a template for future reuse. There are already templates for all American/European Avery label formats. Flexible Templates: Results of time consuming tasks or repetitive processes can be saved into templates. You can save the following settings to templates: data displays, report settings, label settings, html report settings, new records, ....You can switch to different layout, sort, filter, record's display, or create a new record just by selecting the previously saved template from a popup menu. Organizer Deluxe Designer: This feature alone makes Organizer Deluxe one of the most flexible, end-user-oriented database products on the market. Using a helper program called Designer you can define or modify structures for your databases. This allows you to specify the data fields that you need for your application. Therefore, one Organizer Deluxe is like many Organizers in one program - you can use it for all your database needs. Drink Mixer Pro - Mixed Drink Recipe - Over 1400 Mixed Drink Recipe, Alcoholic Drink Recipe, Mix Bar Drink Recipe! AccuChef - Recipe software that allows you to collect, exchange and organize your recipes and much more! 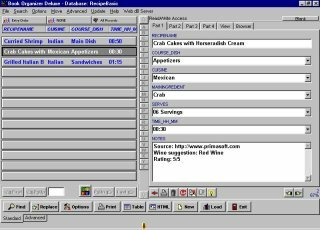 i-Recipes 2004 - Enables you to manage all your recipes with ease. Diet Balancer - A health and nutrition guide that puts complete nutrient data at your fingertips. Recipe Catalog - Stores your favorite recipes and gives you detailed nutrition information. CollegeBAR - For those of you out there that are stuck in the rut of drinking the same one or two mixed drinks over and over again. Audio Record Wizard 3 - record music and sounds from any source from a microphone, line-in, etc. Judy's Kitchen - A great holiday gift! Enjoying delicious meals at home just doesn't get any easier.